Our Top 16 Feature Match has 2 friends from São Paulo face-off against each other! 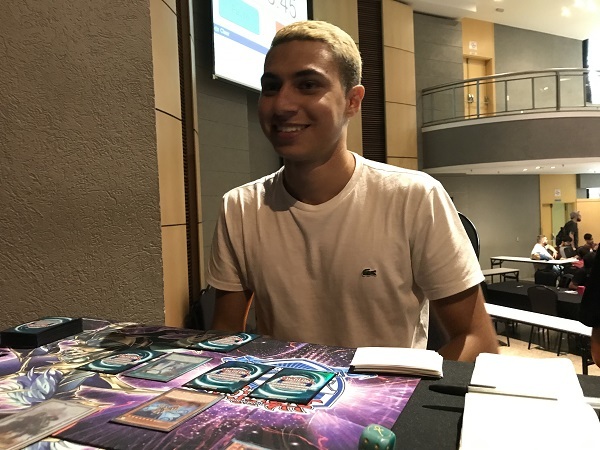 Diego Jun Sakata placed 14th after Swiss and has Burning Abyss with Sekka’s Light and Infernoids while the 30th seed Victor Ferreira Dias has Sky Strikers. Someone’s tournament will end after this match. It’s time to Duel! Dias won the roll and elected to go first. Sakata had a hand of Ash Blossom & Joyous Spring, Scarm, Malebranche of the Burning Abyss, Alich, Malebranche of the Burning Abyss, Decatron and Sekka’s Light. Dias started with Terraforming to add Sky Striker Airspace – Area Zero from his Deck to his hand. He activated it, then Set a card and activated the Field Spell Effect, finding another Sky Striker Airspace – Area Zero and sending the Set Metalfoes Fusion to the Graveyard. He activated Area Zero over the first one then with 3 Spells in the Graveyard activated Sky Striker Mobilize – Engage! but p1 chained Ash Blossom & Joyous Spring to negate it. Dias sent the Metalfoes Fusion in his Graveyard back to the Deck to draw a card. He then activated Twin Twisters, discarding another one to destroy his own Field Spell. The Field effect gave him a Sky Striker Ace – Raye from the Deck, and that Sky Striker Ace – Raye was used to Link Summon Sky Striker Ace – Kagari whose effect let Dias pick up the Sky Striker Mobilize – Engage! and activate it again, adding Multirole from his Deck to his hand. Multirole was activated, Sky Striker Ace – Kagari was used to Summon Sky Striker Ace – Shizuku. Dias Set a card and in the End Phase he used Sky Striker Ace – Shizuku’s effect to add Sky Striker Mecha – Widow Anchor which was immediately activated on Sky Striker Ace – Shizuku. Multirole’s effect Set the Widow Anchor back to the field. Sakata started off with Sekka’s Light, drawing 2 cards. He then used Sekka’s Light’s Graveyard effect, returning Infernoid Devyaty to the Deck to draw a card. Sakata continued by Special Summoning Alich, Malebranche of the Burning Abyss and Scarm, Malebranche of the Burning Abyss. Dias elected to activate Sky Striker Mecha – Widow Anchor on Scarm, Malebranche of the Burning Abyss then he Chained Sky Striker Mecha – Eagle Booster on Sky Striker Ace – Shizuku. 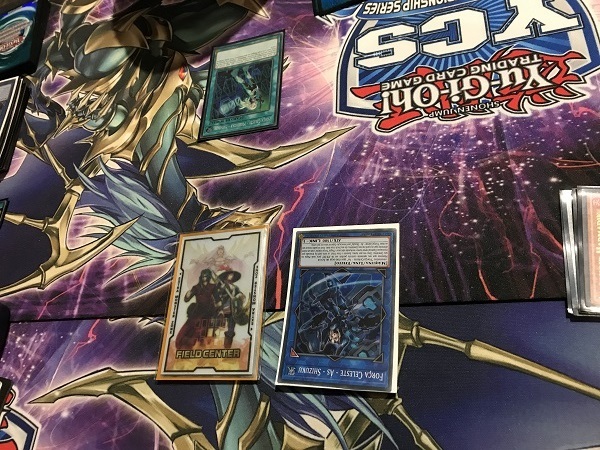 With Scarm, Malebranche of the Burning Abyss in Dias’s possession, Sakata Normal Summoned Tour Guide From the Underworld and used its effect to Special Summon Fiendish Rhino Warrior from the Deck. Both monsters were used to Xyz Summon Dante, Traveler of the Burning Abyss! Dante, Traveler of the Burning Abyss’s effect sent 3 cards to the Graveyard, and the detached Rhino’s effect sent Graff, Malebranche of the Burning Abyss whose effect Special Summoned Cir, Malebranche of the Burning Abyss from the Deck. Cir, Malebranche of the Burning Abyss and Dante were used to Link Summon Knightmare Phoenix to the Main Minster Zone Dias’s Sky Striker Ace – Shizuku was pointing to. Cir, Malebranche of the Burning Abyss’s effect brought back Dante, Traveler of the Burning Abyss and Beatrice, Lady of the Eternal was Summoned over Dante, Traveler of the Burning Abyss! Beatrice, Lady of the Eternal attacked over Sky Striker Ace – Shizuku, and in the End Phase, Dias gave the Scarm, Malebranche of the Burning Abyss back but was sent to the Graveyard because Sakata controlled non-Burning Abyss monsters. Dias switched out Shizuku for Sky Striker Ace – Kagari whose effect added Sky Striker Mobilize – Engage! back from the Graveyard to his hand which was activated to add Sky Striker Mecha – Widow Anchor from his Deck to his hand and drew a card. He then activated Upstart Goblin, giving Sakata 1000 LP and drawing a card. 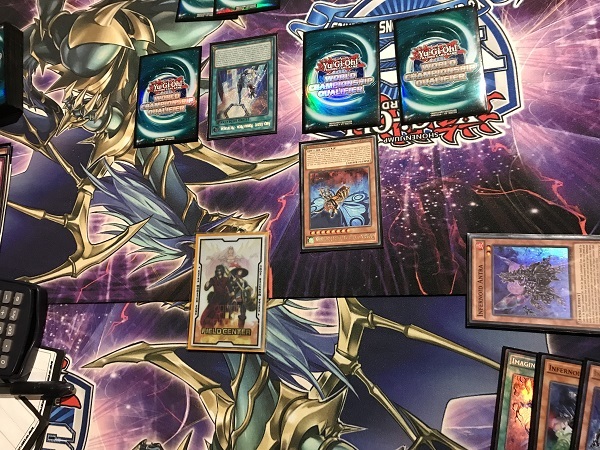 he activated Sky Striker Mecha – Widow Anchor targeting Beatrice, Lady of the Eternal whose effect was activated, detaching Dante, Traveler of the Burning Abyss to send Scarm, Malebranche of the Burning Abyss from the Deck to the Graveyard. Beatrice, Lady of the Eternal went over to Dias’s side of the field. Beatrice attacked over Sakata’s Knightmare Phoenix and Sky Striker Ace – Kagari attacked directly, leaving Sakata at 5900 LP. In Main Phase 2, Dias used his monsters to Link Summon his own Knightmare Phoenix and in the End Phase, Sakata used Scarm’s effect added Farfa, Malebranche of the Burning Abyss from his Deck to his hand. Sakata drew Infernoid Harmadik. He banished another Sekka’s Light from the Graveyard, returning Farfa, Malebranche of the Burning Abyss to the Deck to draw Infernoid Decatron which he Summoned but the effect was met with Dias’s Set Infinite Impermanence! Sakata pressed on by Special Summoning Harmadik form his hand by banishing another Decatron from his Graveyard. He used Harmadik’s effect to destroy Dias’s Phoenix then attacked directly with Decatron for 500. Sakata drew D.D. Crow. He attacked directly with both of his monsters. Dias activated Sky Striker Mecha – Hornet Drones Special Summoning a Sky Striker Ace Token. He used the Token to Link Summon Sky Striker Ace – Hayate. The Link Monster was sent to the Graveyard to Link Summon Sky Striker Ace – Kagari whose effect tried to add back Sky Striker Mobilize – Engage! but Dias chained Harmadik’s effect, Tributing Decatron to banish Sky Striker Mobilize – Engage! from Dias’s Graveyard. In the Battle Phase, Kagari attacked over Harmadik, leaving the Duel at 5200 for Sakata and 5000 for Dias. In Main Phase 2, Sky Striker Ace – Kagari swapped out for Shizuku whose End Phase effect gave Dias Sky Striker Mecha – Shark Cannon from his Deck to his hand. He activated Shark Cannon immediately to banish Sakata’s Harmadik form the Graveyard. Sakata drew Infernoid Patrulea and passed. Dias sent Sky Striker Ace – Shizuku away for Sky Striker Ace – Hayate who connected for 1500 and let Dias send Sky Striker Mobilize – Engage! from the Deck to the Graveyard. In Main Phase 2, Dias activated Foolish Burial Goods to send Metalfoes Fusion to the Graveyard. Hayate swapped out for Sky Striker Ace – Shizuku. Dias tried to use Metalfoes Fusion’s effect but p1 banished it with D.D. Crow. Sakata drew Dogoran, the Mad Flame Kaiju. He passed. Dias top-decked Sky Striker Mobilize – Engage! and Sakata scooped! Sakata elected for Dias to go first. 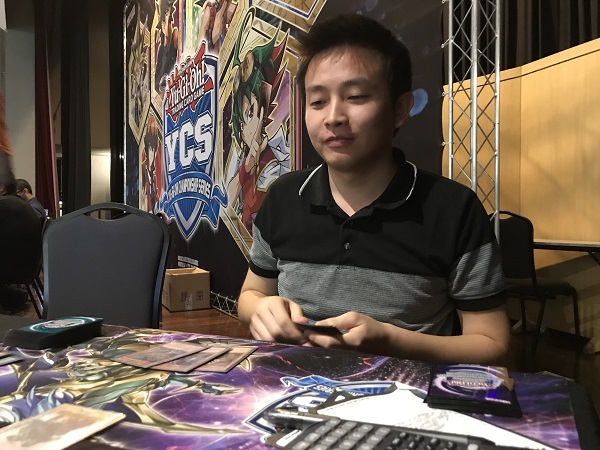 He activated Sky Striker Mecha Modules – Multirole, Set 2 cards to the back and passed. Sakata drew and passed, indicating a very reactive hand. Dias Normal Summoned Sky Striker Ace – Raye and attacked directly for 1500. In the Battle Phase, Raye’s effect Tributed itself to Special Summon Sky Striker Ace – Hayate from the Extra Deck. Hayate’s effect dumped Sky Striker Mobilize – Engage! to the Graveyard where in Main Phase 2, Sky Striker Ace – Hayate swapped out for Sky Striker Ace – Kagari whose effect picked up Sky Striker Mobilize – Engage! and was activated to add Sky Striker Mecha – Shark Cannon from Dias’s Deck to his hand. Kagari went to the Graveyard to Link Summon Sky Striker Ace – Sky Striker Ace – Shizuku. In the End Phase, Sky Striker Mecha Modules – Multirole’s effect Set Sky Striker Mobilize – Engage! form the Graveyard and Sky Striker Ace – Shizuku’s effect added Sky Striker Mobilize – Engage! from his Deck to his hand. Sakata activated Void Imagination but Dias negated it with Ash Blossom & Joyous Spring. Dias then Tributed Dias’s Sky Striker Ace – Shizuku to Special Summon Gadarla, the Mystery Dust Kaiju! Next, Sakata Normal Summoned Infernoid Decatron, sending Infernoid Antra to the Graveyard. Next, he banished Antra to Special Summon Infernoid Harmadik then used both monsters to Xyz Summon Dante, Traveler of the Burning Abyss, but Dias negated the Summon with Solemn Warning. That was enough for Sakata as he extended the handshake and conceded the match! Victor Ferreira Dias moves on to the Top 8!